Welcome to another September 2017 issue of GL's Newsletter providing information and insight into our latest High Density LTE and UMTS Network Simulator that can now generate massive number of UEs (up to 500000) alongwith high volume of mobile GTP and packet traffic for up to 4 Gbps or 40 Gbps which allows to load test or stress test core UMTS/LTE networks. As traffic intensity increases, network elements within wireless network (including switches, routers, gateways and transmission) can impart various impairments such as errors, excessive delay, congestion, blocking, loss, and degrade quality. Their ability to handle huge traffic requires proper test and verification methods. Simulating high volume of mobile data traffic is extremely valuable to analyze the network elements characteristics as a function of traffic intensity and traffic type (e.g. Voice, Fax, Data, Video). For such a test requirement, we can now use GL's MAPS™ Server with PacketLoad appliance. As mentioned, the appliance can now generate massive number of UEs (up to 500000) alongwith high volume of mobile GTP and packet traffic for up to 4 Gbps or 40 Gbps which allows to load test or stress test core UMTS/LTE networks. One of the important features of the appliance is its ability to allow different combinations of TCP/HTTP and UDP traffic combined with PCAP Replay to be simulated from both ends of the network. This helps to evaluate end-to-end core network performance with variable signalling and traffic parameters. The The MAPS™ Server with PacketLoad solution offers high density stateful TCP/HTTP, and PCAP Replay traffic types. It encapsulates the generated packet data within GTP headers and transmit through the gateway points such as SGSN and GGSN, or SGW and PGW. The appliance works with MAPS™ LTE S1, MAPS™ LTE eGTP-c, MAPS™ UMTS Gn Gp, MAPS™ IuPS applications. The 1U MAPS™ Server system controls PacketLoad appliance through CLI. At the generating end, MAPS™ automates the process of creating UEs with different mobile traffic parameters. At the receiving end, MAPS™ with PacketLoad verifies the received data and provides various statistics, which include, Total packets transmitted and received, Latency, Delay, Bandwidth, Total TCP connections created, Successful connections, Packet loss, and more. PacketLoad 4 x 1Gbps (PKS172) - 1U Rack Appliance with 4 x 1Gbps NIC interfaces: total capacity of up to 4 Gbps/sec Stateful TCP/HTTP Traffic. PacketLoad 4 x 10Gbps (PKS174) - 2U Rack Appliance with 4 x 10Gbps NIC interfaces: total capacity of up to 40 Gbps/sec Stateful TCP/HTTP Traffic. By mimicking real-world behaviour in lab environment, our MAPS™ Server with PacketLoad solution allows mobile operators and equipment manufacturers to test various components of mobile infrastructure such as eNodeBs, SGW/SGSN, and PGW/GGSN prior to live deployment. Our solution can be used in testing the network elements in UMTS (SGSN, GGSN, RNC), and LTE (SGW, PDNGW) by generating & validating signalling along with traffic below or above the negotiated QOS. 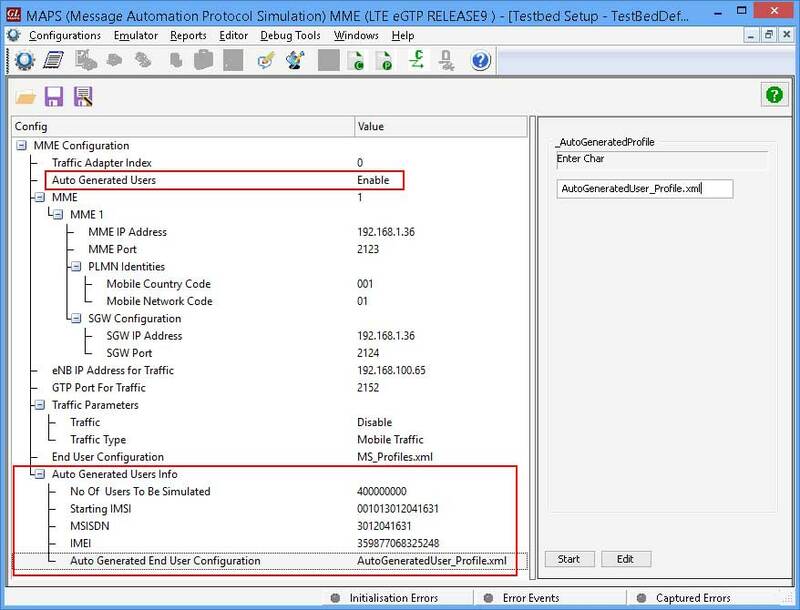 Further, one can setup a virtual real-time LTE network in lab by simulating all the network elements using ‘MAPS™ 4G Wireless Lab Suite’. In real time scenario, there exists huge number of subscribers with unique UE parameters. Creating and maintaining massive number of subscriber profiles with unique parameters such as IMSI, TMSI, MSISDN physically is not feasible. 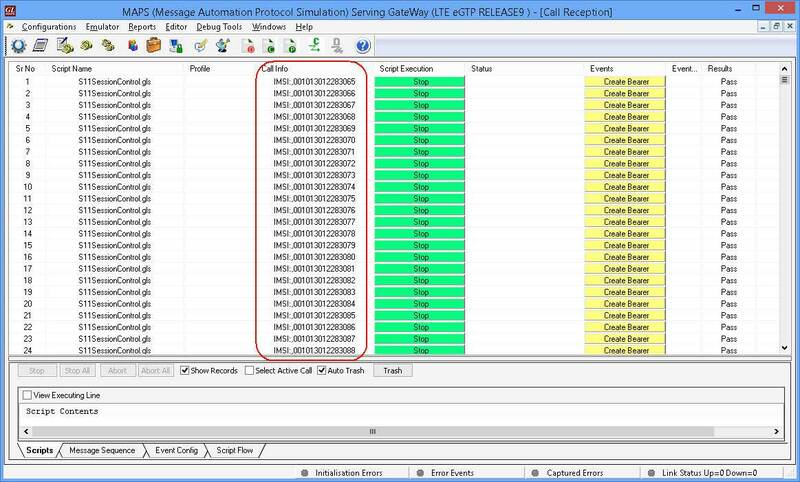 Therefore, recent enhancements were introduced to MAPS™ LTE/UMTS simulation test tools to include Auto UE Generation feature to dynamically generate number of subscribers with unique IMSI, TMSI, MSISDN and other key parameters in sequential order. This ability to auto generate number of subscribers allow MAPS™ to simulate high intensity of mobile traffic. The below diagrams depict GL's MAPS™ Server with PacketLoad platform generating user plane traffic with PacketLoad to conduct high performance testing on DUT. MAPS™ provides useful statistics to verify the simulated mobile data traffic. Users can customize the statistics for the generated stateful TCP/HTTP, and PCAP Replay and other Mobile Data traffic. 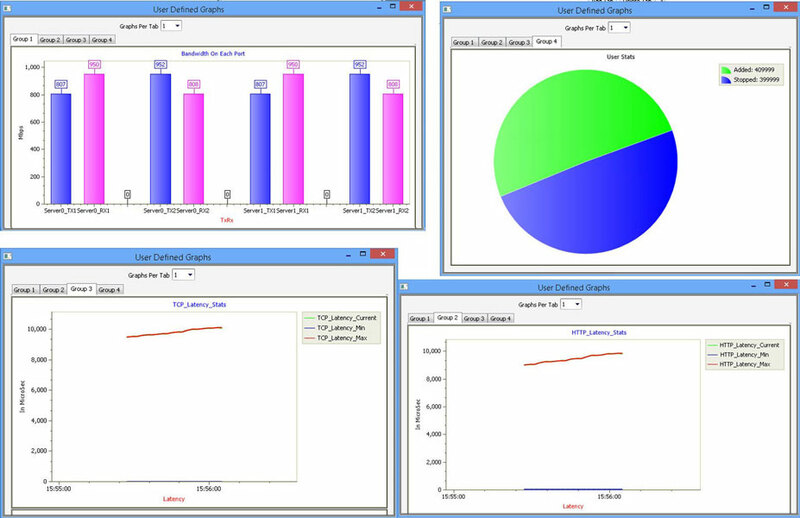 Call Graph uses the results from statistics to plot graphically the Bandwidth on each port, HTTP latency, TCP Latency, and UE related statistics in form Bar/Line/Pie charts.